Visiting Illinois Watercolorist, educator, blogger Jane M. Mason of WatchingPaintDry.com will take us through each sheet in the Wet Paint Watercolor Paper Sampler and lead us in exercises designed to help you really get to know each one. It’s a great way to learn firsthand the unique properties of each type and discover papers that will enhance your painting experience and outcomes. She’ll identify the technique used and recommend that you make notes on your own papers as you develop your own reference library of papers and techniques. Appropriate for all level of painters. Even for experienced watercolorists, reconnecting to papers you may not have used for a while helps to refresh your creativity. She specializes in watercolor, (plein air and in the studio), drawing, photography, textile art, and multi-media collage work. Her subject matter covers the gamut from landscapes, seascapes and urban views, to abstracts, florals and still lifes. Her artwork is in collections across North America and abroad. She has traveled extensively throughout the US and Europe and lived in Florence, Italy as well as the Midwest and New England. Her family has owned a little cabin Up North in Minnesota for almost a century. Jane spends as much time as she can squeeze in at the cabin each year. She is a graduate of the University of Nebraska, with a Master’s Degree in Museum Studies from Harvard University. She has had extensive undergraduate and post-graduate training in watercolor and fine art. Artists she has studied under include: Jim Alinder, Gerald Brommer, Antonioni Catelina, Carol Carter, Cheng-Khee Chee, Joe Fettingus, Frank Francese, Lois Gruberger, Keith Jacobshagen, Paul Jackson, Margaret Keller, Nita Leland, Skip Lawrence, Zenaide Luhr, BillyO O’Donnell, Steven Quiller and Janet Walsh. She is the former president of the Saint Louis Watercolor Society, and the Greater St. Louis Art Association. 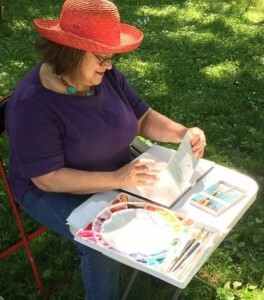 Her articles and artwork have been featured in numerous publications including the St. Louis Post Dispatch, Watercolor Magic, Watercolor, ARTCalendar, and The Artist’s Magazine. She has taught art and art history to all levels for over 20 years. Currently, she teaches online through TakeLessons.com. She teaches locally in Illinois around Chicago, Park Ridge, and Peoria. She teaches workshops in various states. Jane’s work explores connectedness. She thinks about how we are all connected. Her goal is to emphasize our shared experiences rather than our differences. She accomplishes this by using her art to speak from a quiet voice about beauty, color, light, friendship, culture, art traditions, and the gifts of creation we share. It is spiritual, joyful, uplifting, and rewarding work.